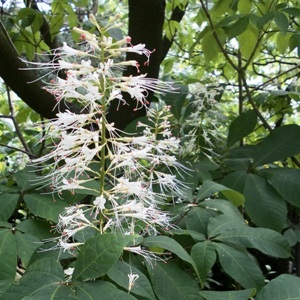 Feathery plumes of white scented flowers cover Aesculus parviflora in late summer. The erect flower panicles are 30 cm long and resemble a traditional bottle brush, standing out like candelabras on the tiered branches and attracting butterflies. The presence of small red anthers in the well spaced flowers adds a soft hint of pink to the mainly white flowers. The common name of ‘bottlebrush buckeye’, is a reference to the flower shape and the highly polished seeds or ‘conkers’, said to resemble the eyes of a deer. Leaves are a warm bronze when young, maintaining a rich deep green through the growing season, before turning a vibrant yellow in autumn. It is a native to open woodlands in the southeastern United States and is able to thrive in sun or light shade, in acid to neutral soils with average soil moisture. The American buckeyes seem less prone to leaf-miner than the traditional horse chestnut, which may result in their wider planting in years to come, which would be welcome for their smaller stature and late summer flowering.